A scientific calculator helps you perform the majority of the laboratory's routine calculations, including trigonometry, statistics, standard deviation, powers, roots, and more. 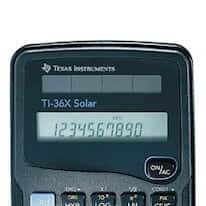 You can choose from a traditional battery-powered scientific calculator or buy one that is solar powered. Another style is the conversion calculator which provides simple and easy conversion of English/metric measurements. You can also have a graphing calculator which allows you to graph in 2-D, 3-D, thick-line, dotted-line, shading and more.